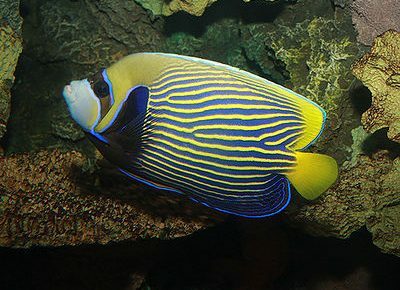 The Red Stripe Angelfish is also called the Eibl’s Angelfish, Eibl’s Pygmy Angelfish, Orangelined Angelfish, Blacktail Angelfish, and Eibl’s Dwarf Angel. Its pearlescent body is highlighted with vertical, evenly-spaced orange to red stripes. A brilliant sapphire-blue stripe outlines the black caudal fin. It is found from Sri Lanka to Indonesia and Malaysia in the tropical Indo-Pacific. The males are 6 in. long, the females about 4 in. 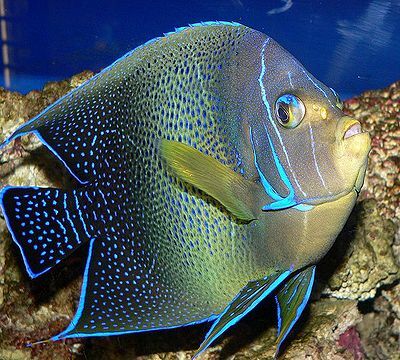 This fish can be housed with most other fish without problems, although it prefers not to be housed with other Dwarf Angels. Tank size is a minimum of 63 gal. The tank should contain lots of live rock for hiding and grazing. Its diet should include Spirulina, marine algae, mysis or frozen shrimp, and other meaty items.